JPM Security Ltd Galway - Intruder Alarms, CCTV, Door/Gate Access Control & intercoms, Monitoring, Electrical, Security Lighting etc. JPM Security Ltd is a Security Business & Alarms company based in Galway, we have over 17 years experience in the Security & Electrical sector. We are fully licensed by the Irish Private Security Authority (PSA), Licence Number: 05435. JPM Security Ltd caters for Home, Office & Commercial buildings in Galway & West of Ireland region. JPM Security Ltd installs all types of Alarm Systems from wired to wireless to suit all your individual needs including Home & Office Business Digital CCTV Systems, Panic alarms, Burglar & Intruder alarms, Smoke and Heat Detectors, Accessible door/window access, Digital IP CCTV cameras, CCTV kits, House, Sound systems, Office & Business keyless entry & Audio/Video Intercom systems, Locksmith, Locks, Security Electrical Lighting and 24hr Alarm & CCTV Remote Monitoring. We are a Galway based security company. 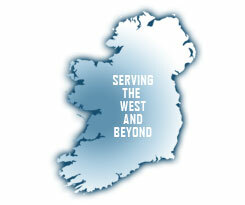 We can provide and install all types of Security Systems in the West of the country (Galway & Mayo). We use state of the art Security components and equipment that is user friendly and which will provide years of trouble free protection and reliability. We can fix, service, upgrade or maintain your old alarm system even if we didnt install it !!! We install Security Systems for home and business from scratch or second fixed ( pre-wired ) and also can provide wireless systems where it is not possible to run cables due to obstructions in the buildings design. JPM Security Ltd is fully insured and is PSA and NSAI certified. JPM Security Ltd can quote you for a full alarm system or can provide you with advice on securing your premises in Galway City & County & Mayo. We provide free quotations that will be dealt with promptly. If you have any queries please contact us on the mobile number or the email address supplied.